This collection is adorable! Not sure what I love more... the shaped paper clips or that great washi! Thanks for the awesome give away chance! Oh how fun that you were asked to design for them with this stuff! Love your super cute page. I love Hello Kitty! Can't wait to stop off at my Michael's to see if they have it in stock. That's so cool you got a chance to play with them before they hit the stores! Ohhhh, this is so cute. I would love to win this collection!!! Oh my gosh! Thank you for telling us about this set and for a chance to win! My daughter is a Hello Kitty nut and would love this collection!! -Sharyn S.
oh love this!! cant wait to see if my local mikes have it yet!!! So cute! Great CAS layout. We could definitely use some Hello Kitty! It's big around these parts. Thanks for the chance to win! I MUST have this! Omg so cute! That is adorable! I have two daughters who happen to be wearing Hello Kitty dresses right now! I can't wait to get some of that line and create with it! This is such a darling collection! Thank you for the chance to win it. I am a 35 year old mom of two boys who still loves Hello Kitty! I remember having Hello Kitty stuff as a young girl, my fave was lip gloss set I got as a gift. Having two boys and no girls, I can't really use it in my books. I still find Hello Kitty adorable and would make card crafts with the line if I won! How fun is that??!! My girls would have a fit!! 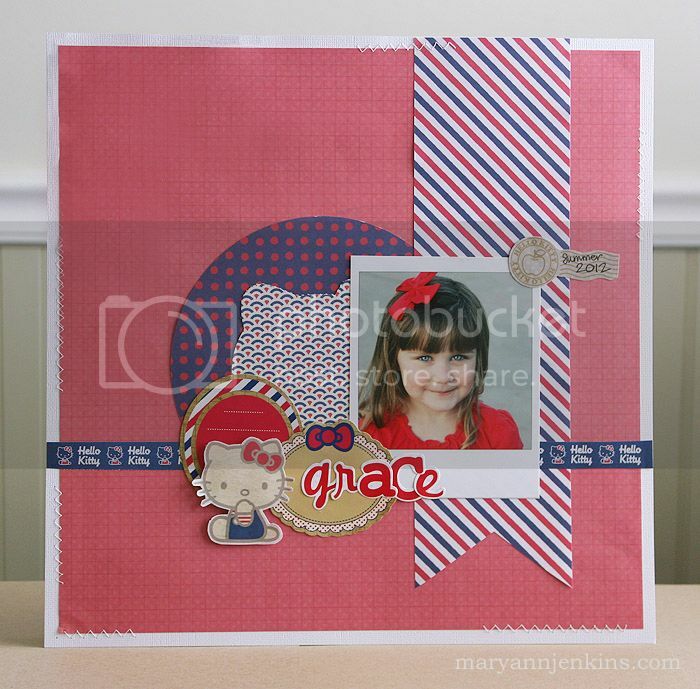 Love the layout you created Mary Ann!! So very cute!! I am loving the air mail pattern and the washi tape is TOO CUTE!! I was just in Michael's yesterday and didn't see anything like this, so I will have to go back over and check it out. BIG congrats on getting to work with the products!! And thanks for the giveaway!! Love that new collection! Very cute layout thank you for sharing! I am so excited about this giveaway. I am a bit older than most Hello Kitty fans, but I adore everything HK. Thanks! Hello Kity was such apart of my childhood. Would love to make some layouts with this!!! My daughter and I love Hello Kitty. These are adorable!!!! Thanks for sharing! Oh my gosh we so love Hello Kitty at our house! I must get to Michael's this week! Thanks for sharing! Oh. MY. GOSH. I have a scrappy friend who is in need of a little lift. She has had some very difficult things to manage in the last few months. She and her scrappy daughter are both big HELLO KITTY fans, so I'd love to win this and pay it forward to them. I don't think they even know this fun new product is out yet! Tee hee! Wow!! I will have to check it out! I love that it is not all pink!! Will for sure o with my pics from the 70s!! Too cute, thanks for the giveaway!! What a cute line and that washi tape! I mean really, how cute is that :D Great layout!!! Very cute layout! I LOVE Hello Kitty! This stuff is just so much fun! I really love the tapes! How lucky are you to have had the chance to play with such cute goodies ! That washi tape is awesome ! My daughter is a Hello Kitty fanatic - she would be over the moon to see all this stuff in our craft space ! Oh and - beautiful layout, and darling little girl ! Oh boy, Hello Kitty caught my eye for sure! Wow would I love to get my hands on some of this super cute goodness! Adorable layout and products! Can't wait to see it in person! I hope I'm not too late to enter for this giveaway because I am a huge Hello Kitty fan! I've loved HK since I was a little girl and now my 2 year old is crazy about her! Thanks for the chance to win. I'm a new follower! So cute! My daughter had a Hello Kitty Birthday and this would be perfect to help create the page! Just picked up the date stamp today and now I need the rest! DD loves HK, so this line is great! Just saw them today and its so cute in person! Thanks for the chance. I see a trip to Michaels in my future today!